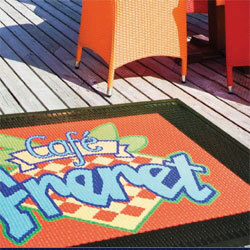 Your custom logo mats can be created on any of our three different materials for different applications: Nylon printed carpet for indoor use, water resistant fabric inlaid for indoor or outdoor use and 100% rubber material for indoor or outdoor use. Best Value. 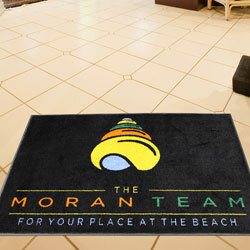 Printed logo mat for high traffic. Nylon carpet rubber backing and borders. Better Quality. High Definition printed. Heavier nylon carpet. Rubber backing and borders. Weather Proof. Water resistant fabric w/ rubber borders and backing. Fabric inlaid process. Heavy Duty Exterior. 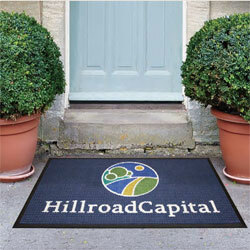 Rubber Scraper mat 3/16" thickness. 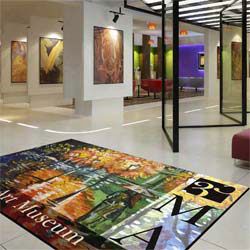 Digital printed high definition.